I first drove the new Volkswagen e-Golf a year ago. But a preview drive in the Virginia countryside isn't the best indicator of what daily life with the electric car would be like. Recently I was scheduled to have a Kia Soul EV (electric vehicle) for a week. Might VW have an e-Golf available for comparison purposes? They did, and I spent the week alternating between the two electric cars, with a test drive of the BMW i3 thrown in for good measure. I knew the e-Golf was pretty good, but I did not expect it to upstage not only the Soul EV but even the much more expensive BMW as much as it did. For 2015 light gray was the only interior color opion. For 2016 you can get beige or black. The top reason to buy nearly any EV is fuel economy. Both the e-Golf and the Soul EV used about 20 kWh of electricity per 100 miles of suburban driving, with the Volkswagen perhaps ten percent more efficient than the Kia. Their EPA MPGe (miles per gallon equivalent) ratings are 126/105 and 120/92, respectively. The BMW i3, with about 700 fewer pounds and much skinnier tires, outpoints them both (and all other current EVs), with 137/111. Assuming 30 MPG and $2.50 per gallon (low by recent historical standards), a fairly efficient gasoline-powered car burns 8.3 cents of fuel per mile. Drive a little over 10,000 miles a year, and the annual EV savings works out to $600 even assuming 12 cents per kWh. Of course, that's quite a few qualifications. Running the heat or A/C will significantly reduce range, even with the more efficient heat pumps standard in both cars (except for their base trim levels). To help avoid this, the seats in the top trim Soul EV+ can be heated or cooled. Those in the e-Golf can only be heated. Highway miles drain the battery packs even more quickly than the EPA figures suggest, because the EPA assumes a relatively low cruising speed. On a 70-MPH Interstate the e-Golf's range fell by about a third. The Soul EV and BMW i3, with taller, chunkier bodies, should suffer at least as much. Still, I drove 99 miles without recharging in the e-Golf despite spending about 40 of these miles at (or slightly above) 70 MPH. Without the highway portion the car's range would have been well over 100 miles. Most people rarely need to drive farther than this in a day unless they're traveling (in which case a non-Tesla EV isn't practical). Recharging via a standard wall outlet can take over 15 hours in either car. Anyone who often will drive more than 50 miles per day should seriously consider having a 240-volt charger installed in their home. These cost about $600 plus installation, which can easily add another $600 (depending on the specifics of your home's layout and electrical system). With the obvious covered, now for the far from obvious: Volkswagen has priced the e-Golf very aggressively. I didn't initially realize this, as the top-trim e-Golf SEL Premium lists for $36,415, just a few hundred less than the $36,775 Soul EV+, which includes some luxury features not available in the Volkswagen (leather upholstery, heated steering wheel, cooled front seats, heated rear seats). But the e-Golf SEL Premium has quite a few features that the Soul EV does not have, including LED headlights, an electrically heated windshield, and power recliners for both front seats. Overall the VW has nearly $1,000 in additional content. Then there's the fact that a gas-powered Soul undercuts a gas-powered Golf by about $3,500. The Golf (as we shall see) doesn't only drive like a more expensive car, but it usually is a more expensive car. Only with the EVs are their prices about the same. How can this be? Apparently Kia charges far more for its EV bits. Even after a $7,500 federal tax credit a Soul EV costs about $4,000 more than its gas-powered sibliing. VW? After factoring in the tax credit an e-Golf actually stickers for a few hundred less than an equivalent Golf 1.8T. Yes, less than the gas-powered car. I did not see this coming. But relatively low pricing won't sell cars if many people don't want to pay for a high level of standard content. For 2016 both Kia and VW are offering decontented EVs with lower prices. After the federal tax credit the new Soul EV-e lists for $25,275. And the new e-Golf SE? Just $22,315. To provide a price lower by $4,000, Kia removed about $3,600 worth of features, so relative value remains about the same. This isn't the case with the e-Golf. While VW cut the price by $6,600, it reduced content by only about $4,500. If you can do without quick-charging capability, the additional efficiency of a heat pump, LED headlights, cruise control, and nav, the e-Golf SE is a steal. If you want quick charging (which roughly halves the charge time when using a 220v outlet and also permits the use of public DC ultra-fast chargers), it's available for another $1,675. How much more is the much smaller but higher tech BMW i3? If you have to ask...well, only $7,680 more. Carbon fiber body structures and the BMW roundel aren't cheap. I've focused on what it costs to buy these cars. With EVs many people opt to lease, and I'm hearing that lease payments might be much lower for the Soul EV than for the e-Golf. The seventh-generation Golf is the most attractive to date. But not exciting to look at. Clear, logical controls--except for the antiquated nav. Additional far from obvious: not only did I enjoy driving the e-Golf more than I did the Soul EV, but more than I did the 292-horsepower Golf R. In daily driving the Soul EV feels like a competent appliance, while the Golf R feels overqualified and undertaxed (and admittely suffered from higher expectations). At legal speeds there's zero drama. The e-Golf, in contrast, feels just about perfect running around town, with lively responses, precise steering, a slop-free yet compliant suspension, and a solid body structure. In turns taken at speed, the e-Golf leans and understeers considerably less than the Soul EV or the i3 (which, probably thanks to its height and its skinny tires, didn't handle as well as other reviewers led me to expect). In retrospect, the e-Golf's balance shouldn't have been so surprising. The amidships location of its battery pack grants a much more balanced (and less nose-heavy) weight distribution than in any fossil-fueled Golf. Add it all up, and short of a Tesla (which costs over twice as much) the e-Golf is likely the best-driving EV (I haven't driven all of them). Though the e-Golf costs about the same as the Soul EV, it rides and generally feels like a much more expensive car. Roads in my area have frost heaves, potholes, and disintegrating pavement to spare. The e-Golf sailed across the lumps almost as if they weren't there. It's tight and precise, yet without harshness. The original Golf revolutionized the automotive world by demonstrating how practical a small car could be. Though the latest, seventh-generation Golf is much larger than the original, and every major auto maker now offers a Golf-like compact, the Volkswagen continues to impress with its practicality. Let's start with the front seat. The seat itself is shaped and padded to provide nearly ideal comfort and support in daily driving. The performance buckets in the GTI and R have firmer bolsters that provide more lateral support, but the regular Golf's buckets are cushier and more comfortably contoured. The e-Golf uses the same exemplary seats. In comparison, the seats in the Soul EV are merely okay. The view forward from the e-Golf's driver seat is also about as good as it gets in a current compact, with a reasonably-sized instrument panel and an expansive, comfortably raked windshield flanked by relatively thin pillars. This said, some people might prefer the higher driving position in the quasi-crossover Soul EV. For me, a conventional car's lower position continues to feel more natural, especially in turns. Battery packs take up space. Even with the (roughly) 1.5-kWh battery packs used by hybrids cargo capacity usually takes a hit. In the Soul EV, rear seat legroom suffers a three-inch reduction due to the underfloor location of the car's 27-kWh battery pack. But VW engineers managed to design and package a 24-kWh battery pack so cleverly that the e-Golf's passenger and cargo room are identical to those of a regular Golf. Adults will comfortably fit in the car's back seat. The same can't be said about most other EVs--the Soul being a second exception. Even with the three-inch cut, the Kia's back seat is about as roomy as the Golf's. The i3's back seat is far tighter. Which EV treats its passengers best depends on the season. The e-Golf includes rear air vents, while the Soul EV+ includes rear seat bun warmers. Moving to the cargo area, the Soul EV's battery pack eats up a dozen cubic feet, leaving just under 50. The uncompromised e-Golf can contain a couple more. But these figures don't convey the differing proportions of the cars' cargo holds. The e-Golf's is a few inches longer, while the Soul EV's is a few inches taller. Which is the better cargo hauler depends on the shape of your cargo. The much larger Tesla Model S can hold a few more cubic feet, the Mercedes-Benz B-Class about the same as the e-Golf. No other EV comes close, especially not the 12-cube BMW i3. Range is the most obvious reason not to buy a Volkswagen e-Golf, or any EV with the possible exception of the Tesla. If you drive more than 100 miles in a day more than a few times a year, the e-Golf isn't a viable option. Most of the other reasons not to buy an e-Golf (including all of the non-obvious ones) are far less compelling than the reasons to buy one. Some people will figure that, since VW has had trouble with relatively simple electrical components in the past, a VW EV might not be a good idea. The latest Golf has been pretty good in our car reliability survey so far, but the cars are still very young. At this point the e-Golf's long-term reliability is unknown--as is the Soul EV's. Exterior styling could be a reason not to buy an e-Golf. While the BMW i3 looks like a prop from a movie set in some science fiction future, the e-Golf looks much like any other Golf. Yes, it has unique wheels and a blue line running across its front end. And the seventh-gen Golf is the most artfully styled to date. But this artfullness is subtle, and the great majority of people won't perceive anything special. Instead, they'll see the same iconic but now ubiquious shape they've been seeing since 1974. The Soul EV similarly looks much like any other Soul, just with a white roof and wheels. (I'm not a fan of the high-contrast bright blue / white combo.) 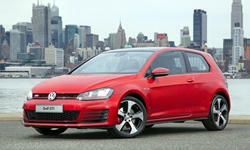 But even the regular Soul has been styled to stand out in traffic, where the Golf blends in. The e-Golf's face gains a blue line and unique LED DRLs. On the SEL the headlights are also LEDs. Adult-friendly back seat, with vents. Volkwagen did even less to differentiate the e-Golf's interior from the regular Golf's. Unlike in the Soul EV, you'll find no LCD instrumentation and no high-contrast trim. Just a basic light gray interior, with all the visual excitement light gray suggests. (In the 2016, interior color choices are black and beige.) Like that of the exterior, while the styling of the interior could hardly be more tasteful, it could be much more exciting. The BMW i3, with inventive, fix-what-is-not-broken design inside as well as out, has a clear edge in this respect. I'll also note that while some synthetic leather (i.e. vinyl) convincingly passes for real leather, VW-Tex doesn't. Instead, it looks and feels rubbery. Otherwise materials inside the VW are a cut or two above those in the Kia. For safety- or luxury- minded folks there are stronger reasons not to buy a Volkswagen e-Golf. Neither the e-Golf nor the Soul EV offers the latest safety features such as forward collision warning, automatic braking, lane deparature warning, or blind spot warning. This is a bit of a surprise, as some of these features are available on the regular Soul and all are available on the regular Golf for 2016. Both tested cars had obstacle detection at both ends, but this aid to parking is of limited value in such compact cars. Volkswagen also opted not to offer a few luxury features available on the Soul EV: cooled front row seats, heated steering wheel, heated second row seats, leather upholstery, and a panoramic sunroof. The first three could aid efficiency by reducing the need to use the car's heating and air conditioning. Of course, none of this matters if you cannot even buy an e-Golf where you live. As I write this, the car is only available in some states: California, Conneticut, Maine, Maryland, Massachussetts, New Jersey, New York, Oregon, Rhode Island, Vermont, and Washington, DC. The list is a little different for the Soul EV: California, Georgia, Texas, Oregon, Washington, Hawaii, New York, New Jersey, Connecticut, and Maryland. More states will be added in the future. I suffered severe range anxiety towards the end of a 99-mile run in the e-Golf. At the 80-mile mark I thought I could easily make it home. Then the forecast range started falling by more than one mile per mile driven, even though I switched to Eco+ mode (which dramatically reduces motor power) and babied it. Maybe they wanted to make sure I didn't run out? When it became clear that I couldn't make it home, I sought a public charger. The 2015 e-Golf had an antiquated nav system with very little modification for EV use. Charging stations are among the POIs you can select to display. I got tired of fussing with it and ended up driving to a location I knew had free public chargers. I reached this public charger with a single mile remaining and pulled into the space. I then discovered that the cord wasn't long enough to reach the VW's port, which is located behind an unmodified fuel door on the right rear fender. I had to pull out of the slot, then turn the car around and back in. Luckily the e-Golf still had at least a few feet of range remaining. The Kia's port is much more conveniently located in the car's nose, so you can pull forward into spaces with public chargers. After charging for about 30 minutes, I decided to attempt the eight miles to my house--but I could not get the charger to release. After trying to figure out what I was doing wrong, I consulted the owner's manual. It turns out that you have to hit the unlock button on the keyfob or inside the car to release the charger--even if the car's doors haven't been locked. For 30 seconds after hitting the unlock button the car stops charging and the charger can be removed. I did not discover this while charging at home because some previous reviewer had decided to play "sword in the stone" and had broken the plastic latch off the charger that was supplied with the car. This wouldn't have happened with the public charger--it had a steel latch. The Soul EV's nav more prominently features a list of charging stations. It even took the initiative to display a list nearby stations when range had decreased to 35 miles. The Kia system also provided more detailed and visually engaging EV-specific route information and driving efficiency aids. To get similar features on the 2015 e-Golf you had to use phone-based apps. My relative rating applies to the 2015s. The 2016 e-Golf has a new, improved infotainment system that should reduce this disadvantage, and possibly eliminate it entirely. The 2016's nav system also should be much better than the dated rudimentary unit in the 2015. Like all EVs, both the Volkswagen e-Golf and Kia Soul EV feel quicker than than actually are, especially at low speeds. Electric motors deliver their maximum torque almost instantly and at ultra-low rpm. Beyond their instant-on nature, electric motors are also much smoother and quieter than gasoline ones. Accleration feels more like that in an elevator (albeit in a horizontal rather than a vertical direction) than that in a conventional car. As a result, driving an EV around town can be relaxing and soothing. The run from 30 to 60 MPH isn't as impressive as that from zero to 30 MPH, but when pressed neither car feels sluggish. Either can get from a dead stop to 60 MPH in about ten seconds, which was the boundary for "quick" back when the e-Golf's performance-oriented sibling, the GTI, first made a name for itself. The BMW i3, with more power and less weight, is capable of getting to 60 a couple seconds sooner. This is of limited utility. I rarely felt the need to accelerate the e-Golf or Soul EV more quickly than it was capable. And, given how the BMW i3 handles, I wasn't inspired to make use of its additional power. For a discussion of safety features, see the "feature availability" section. I'm hijacking "safety and braking" to discuss how regenerative braking (regen) works in these EVs. Much like Tesla, BMW has opted for full regeneration when the accelerator is released, such that the i3 often can be driven without touching the brake pedal. In other EVs, you get minimal regen by just lifting off the accelerator. The brake pedal initially engages regen, but when more braking force is requested than regen can deliver the conventional brakes are engaged. Managing the transition from regen to conventional brakes with a single driver input for both has been tricky. Though in my opinion current hybrids and EVs do at least okay here, some other reviewers remain critical of brake feel in most hybrids and EVs. The e-Golf includes an interesting solution. Four levels of regen are available when you lift off the acclerator. The car's trip computer reported that these four levels generate zero, 15, 28, and 42 kWh per 100 miles, respectively. The last felt about as aggressive as the default in the BMW. Switching among these modes is not only easy, but entertaining: just nudge the shift lever to the left. The experience is somewhat like downshifting a manual transmission to increase engine braking. Fun. Inexpensive to operate and practical, yet also fun to drive and aggressively priced, the Volkwagen e-Golf is a surprisingly good car. The Soul EV, though better than most other EVs, isn't nearly as enjoyable as the e-Golf and generally feels like a lesser car. The key weakness of the e-Golf is that Volkswagen could have done too good a job making it look and drive much like a regular, award-winning Golf. Even the Soul EV does quite a bit more to communicate that you're driving something special, while BMW has taken a radically different approach with the i3. In this sense, the e-Golf is the most boring electric car. In sharp contrast to the BMW i3, there's nothing "gee whiz" about the Volkswagen--except that it does just about everything so well. The thing that looks like a cylinder head? Probably the inverter. The motor is under the beam. Aside from the Tesla Model X, about as much cargo volume as you'll find in an EV. Even after my troublesome ownership experience of a 2002 Passat V6, I'd consider the e-Golf. My 12 Leaf was a great start for EV technology, but cars like the -Golf are probably better. I would especially like the variable regen. It would be interesting to know how the e-Golf's range does with heat running. My 12 Leaf was awful in this respect, due to its resistive heater. Newer Leafs (and I think most EVs now) use a much more efficient heat pump. Watching your range fall by up to 50% during a PA winter is annoying. My point is that I'd like to see EV mfrs develop a way to communicate the truth about range to their customers, which should also include guidelines for battery degradation over time. Nobody should buy an EV thinking their commute can equal the EPA rating. Personally, I'd divide the range rating by 4 to ensure I have enough range for all conditions, and the extra detours that life brings. But here's a huge shortcoming of the e-Golf: It is a 'compliance' car, so it's only available in a few states. Kia has done the same thing with the Soul EV, and Fiat with the 500e. Too bad. Even still, VW has managed to grab 3% of the EV market so far this year. Thanks for bringing this up. The e-Golf SEL and the Soul EV and EV+ have a heat pump. I just did some digging to determine that the e-Golf SE probably does not have a heat pump.